Community solar is a way for landowners, organizations, the utility and residents to work together to capture and benefit from solar energy by building solar gardens where they will be most valuable. Nokomis Partners works with local landowners to install a solar garden on their property. 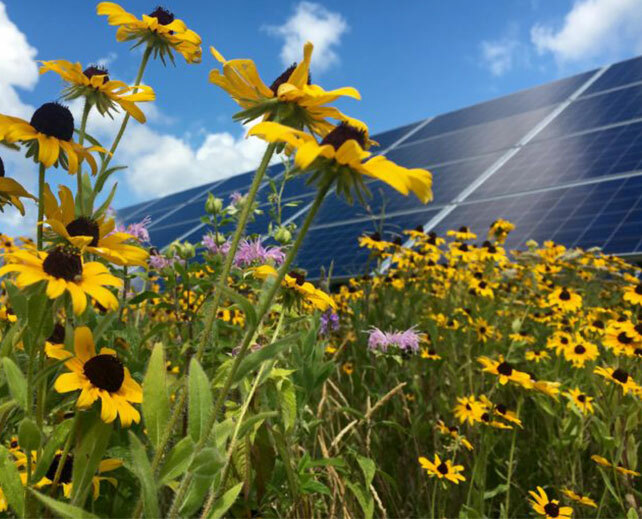 The solar garden is connected to the local electric grid and the utility provides Nokomis Partners with bill credits for the energy we produce. Nokomis Partners sells the bill credits to local organizations and residents in the form of a subscription to the solar garden. 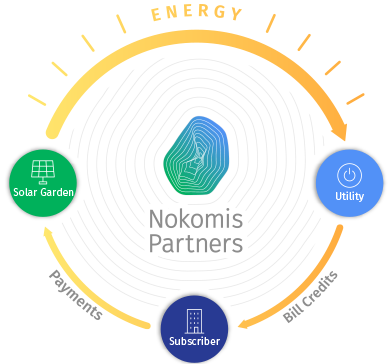 Nokomis Partners uses the subscription payments to pay the landowner and local service employees to maintain the solar garden. You don’t start paying until the projects generate electricity. You will receive bill credits on your Xcel bill and reduce your electricity costs. Unlike energy efficiency or rooftop solar, community solar is installed off-site. No changes to your building or your energy usage behavior. Our fixed savings rate means you always save money no matter if the utility rates rise or fall. With more certainty comes less risk. Get paid to host a solar garden on your land. Save on your energy bills with no changes to your facility. Community solar is unique in that it creates value for all project stakeholders. Landowners benefit from reliable, 20+ year, above-market-rate revenues. Residents and organizations save money by reducing energy bills. The utility company and subscribers get a clean, renewable source of energy and defer infrastructure upgrade costs. Local construction, operations and maintenance firms get reliable, 20+ year employment opportunities. Everyone contributes to local economic development, improves energy infrastructure, and reduces pollution. Who can subscribe to community solar? Any individual, organization or municipality within Xcel’s service territory in Minnesota. Your maximum subscription is based on 120% of your last 12 months electricity usage. If you do not have 12 months of usage a standard calculation is used. Your usage is converted from kilowatt-hours (how electricity is measured) to kilowatts (how solar panels are rated). You cannot subscribe to more than 40% of a one community solar garden, but you can subscribe to as many community solar gardens as you want up to your maximum subscription amount. Can I cancel or exit the contract early? Yes. You must give notification of at least 90 days. This provides time to find a new subscriber. If a new subscriber cannot be found, you must pay the termination fees as detailed in your contract.